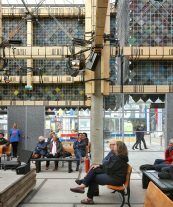 The icon of the first World Design Event (WDE), the People’s Pavilion, a design by Overtreders W and bureau SLA, was presented during Dutch Design Week 2017 in the middle of Strijp-S. 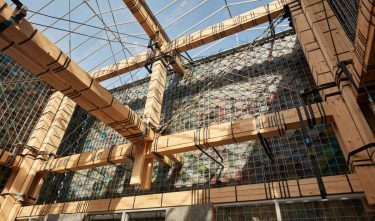 The designers built the pavilion using loaned and repurposed materials, resulting in a colourful façade of recycled plastic and a wooden skeleton of borrowed components: a building with an ecological footprint of almost zero. After all, raw materials were not irretrievably lost during construction; all materials used were returned undamaged to the owners afterwards. 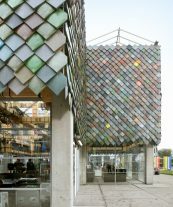 The designers of bureau SLA and Overtreders W give new meaning to the concept of circular building. Keeping all the materials used intact has also led to a new design that mixes aesthetic and practical elements in a fascinating way. 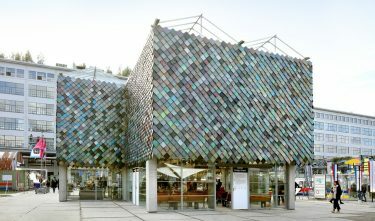 The People’s Pavilion is therefore a stimulating exploration of the possible forms for sustainable building. The project links a powerful design language to a continual and necessary search for new collaborations and intelligent building methods. The designers’ clearly radical approach is refreshing, honest and consistent.